Now a decade into the 21st century the way we make, teach, understand, experience, and support the arts are in constant flux. In order to take the first steps towards addressing change in the arts sector it will be essential for the field to tap the ingenuity of its youngest professionals. Ironically, due to low pay, unreliable career paths, frustrating glass ceilings, and a lack of agency and autonomy, the arts sector is currently experiencing an exodus of Gen Xers and Millennials just when it needs their insights the most. 20UNDER40 brings the voices of these young arts leaders out of the margins and into the forefront of our cultural dialogue. The first project of its kind, 20UNDER40 began with a call for chapter proposals that attracted over 300 submissions and generated buzz throughout the Internet. The selected authors within the anthology represent a diverse array of arts professionals including teaching artists, administrators, dancers, filmmakers, musicians, screenwriters, activists, visual artists, graduate students, professors, scientists, entrepreneurs—even a television show host. The 20 chapters discuss widely ranging, innovative ideas that intelligently tackle the challenges faced by the arts sector today while offering bold solutions and renewed hope for the future. 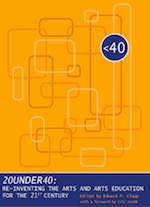 Visit our history page to learn more about the trajectory of the 20UNDER40 project. 20UNDER40 is a sponsored project of Fractured Atlas, a non-profit arts service organization. Contributions on behalf of 20UNDER40 are tax-deductible to the extent permitted by law. Edward P. Clapp—Edward has worked as an artist, teaching artist, and arts administrator for a decade. He currently serves as a consultant for arts and arts education organizations while pursuing his doctoral studies at Harvard University’s Graduate School of Education. Eric Booth—Eric is a popular independent arts consultant and also the founder of the Teaching Artists Journal. He has written several books and articles on the arts and arts education, including The Everyday Work of Art and The Music Teaching Artist’s Bible. Julia Propp—Julia serves as the Marketing and Communications Manager for the Office for the Arts at Emerson College and ArtsEmerson: The World On Stage. Julia is also a Young Nonprofits Professionals board member. Andrea Sachdeva—Andrea is the Director of Evaluation + Curriculum for the Cloud Foundation and the Boston 100K ArtScience Prize. She is also a freelance program evaluator and a founding co-chair of the Continuing the Conversation series of arts education events hosted by the Harvard Graduate School of Education’s Arts in Education program. Pressler Collaborative—Founded by Ciara Pressler, Pressler Collaborative creates custom marketing solutions for small businesses in arts, entertainment, fitness, and lifestyle services.